Davidsen, Conny. "Oil Sands". The Canadian Encyclopedia, 03 February 2018, Historica Canada. 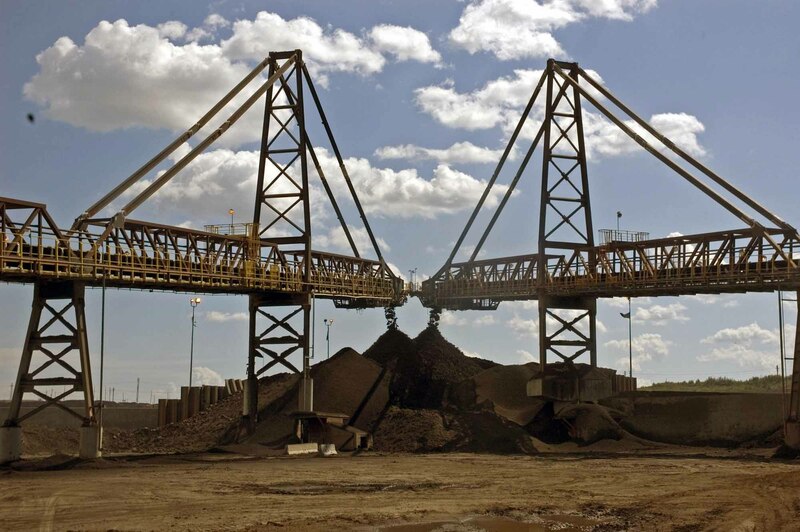 https://www.thecanadianencyclopedia.ca/en/article/oil-sands. Accessed 20 April 2019. The Canadian oil sands (or tar sands) are a large area of petroleum extraction from bitumen, located primarily along the Athabasca River with its centre of activity close to Fort McMurray in Alberta, approximately 400 km northeast of the provincial capital, Edmonton. Increased global energy demand, high petroleum dependency and geopolitical conflict in key oil producing regions has driven the exploration of unconventional oil sources since the 1970s which, paired with advances in the field of petroleum engineering, has continued to make bitumen extraction economically profitable at a time of rising oil prices. Oil sands are called “unconventional” oil because the extraction process is more difficult than extracting from liquid (“conventional”) oil reserves, causing higher costs of production and increased environmental concerns. A large pumpjack high in the mountains. Alberta’s first commercial oil sands operation started in 1967. The exploration of oil sands significantly increased Canada’s total oil reserves from approximately five billion barrels to an estimated 173 billion, meaning Canada has the third largest oil reserve in the world, with 97 per cent of the oil in the form of oil sands. The sands cover about 140,000 km2 (about 20 per cent of the province of Alberta, and roughly the size of the state of Florida). 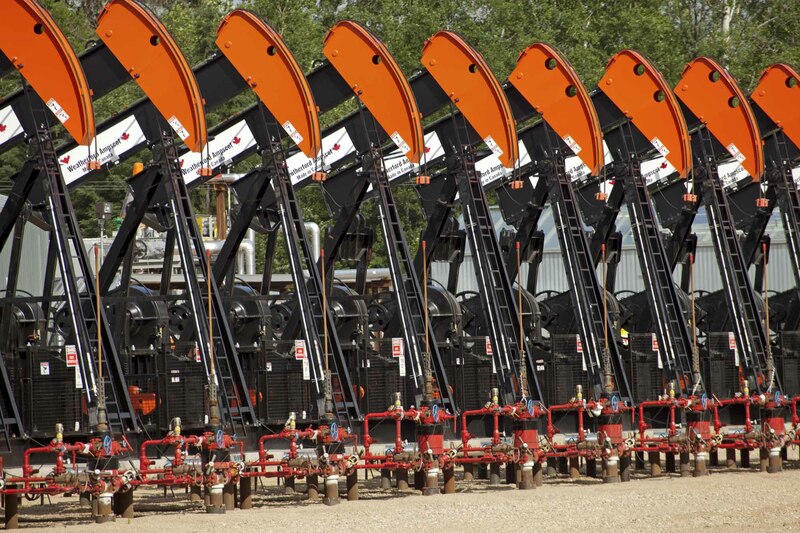 About 66 per cent of them have already been leased to companies for oil sands extraction (93,000 km2 as of January 2013). In 2012, oil sands extraction contributed an estimated $91 billion to Canada’s gross domestic product, and over 475,000 jobs (three per cent of the nation’s total) may have benefited to some extent. Over half of Canada’s oil production currently comes from the oil sands (about 1.8 million out of 3.2 million barrels per day). Growth trajectories vary, but production may double in volume between 2010 and 2030 to 6.7 million barrels per day, with all growth coming from the oil sands. 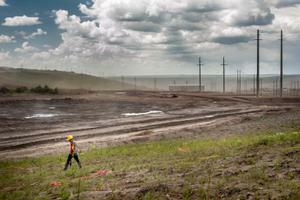 Oil sands extraction occurs through two major approaches: surface mining and deep drilling called in situ. Surface mining first strips the area of the so-called overburden (i.e., vegetation, soil and earth layers above the bitumen), and creates large open-pit mines from which the bitumen is removed with shovels and trucks to be physically and chemically processed. Based on current technologies and their economic costs, oil sands operators use surface mining for areas where the bitumen is up to 70-100 m below the surface. For areas where the bitumen layer is deeper, in situ drilling is used. As the Latin term for “on site” suggests, this type of drilling leaves the vegetation and soil layers above the bitumen largely intact and instead pressure-pumps the bitumen to the surface after heating it underground. 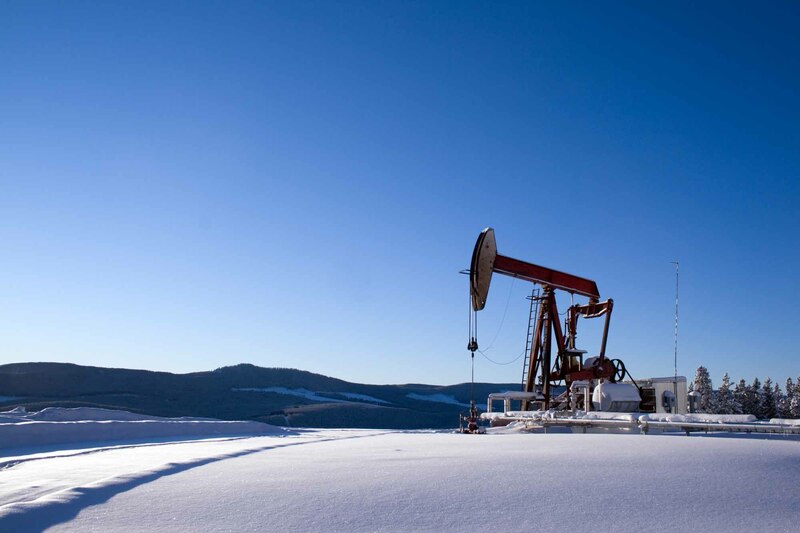 The technologies that made this method possible — steam-assisted gravity drainage (SAGD) and cyclic steam stimulation (CSS) — marked the beginning of large-scale commercial in situ drilling, which significantly changed the dimensions of Canadian oil sands extraction from the early 2000s on. 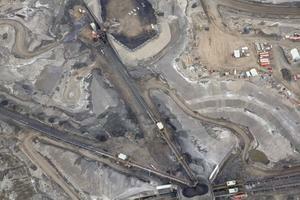 Environmental impacts and concerns from oil sands extraction are multifold and affect the region as well as the planet. They include high carbon and other greenhouse gas emissions; regional air pollution; introducing toxic materials in the soil, water and air; loss of ecological habitat and biodiversity; water pollution; forest destruction; toxicity and seepage from tailings ponds; ecological restoration prospects after mining impacts; and high input of energy and water in general. Surface mining in particular has come under public scrutiny for its visible ecological impacts on the natural landscape. Over 715 km2 of boreal forest have already been destroyed or affected by oil sands mining and an additional 4,700 km2 have been licensed for surface mining (an area roughly 78 times the size of New York City’s Manhattan Island). To produce one barrel of oil from surface mining, up to two tonnes of tar sands must be moved depending on the location, two to five barrels of water used and an estimated 35 kg of carbon dioxide are emitted. In situ drilling leaves the vegetation cover of the immediate extraction area intact, but it widens the geographic reach of oil sands extraction significantly into areas where the bitumen layers are too deep to be viable for surface mining. It has high environmental costs, too: every barrel of oil produced by steam-assisted gravity drilling causes an estimated 55 kg of carbon emissions and burns 28 m3 of natural gas. Over 88,000 km2 have been licensed for in situ drilling as of January 2013. Related controversy arises from oil pipelines, such as the Keystone Pipeline system (Canada-US Gulf Coast) or Northern Gateway Pipeline (Alberta-British Columbia). These debates address concerns over potential immediate environmental impacts along the pipeline (e.g., possible spills, construction and maintenance), as well as the underlying long-term decision for or against oil sands commercialization and its related infrastructural commitment, economic trajectory and environmental implications. Fort McMurray is the local economic hub of the oil sands operations. The region is associated with high regional employment and revenue, as well as with socio-economic disparities and social impacts. These impacts include high cost of living; transient community; “gold rush” effects; unbalanced demographic structure (i.e., the population is primarily male, and young); high dependencies of the local economy on volatile energy markets; and uncertainty of future budgets regarding social programs, infrastructure and environmental clean-ups. Located along the Athabasca River, Fort McMurray is upstream from the oil sands operations, while Fort McKay and Fort Chipewyan, two Aboriginal communities, are facing higher environmental impacts further downstream. Bitumen deposits, oil sands and tar sands all refer to the same material. As controversy grew over their commercial extraction, political connotations emerged and “oil sands” became preferred by proponents of oil sands extraction because it emphasizes the final market product, while “tar sands” was used by its critics because it emphasizes the difficult extraction process and environmental problems of thick bitumen. The environmental and social impacts of the Canadian oil sands have led to widespread debate and critiques over the scope of their future development. There are ongoing discussions about environmental regulations and ecological monitoring practices, decision-making and approval processes, distribution of economic benefits between Canadian taxpayers and foreign investors, as well as socio-economic benefits for the region. Canada and Alberta’s carbon and energy strategies have also been called into question, as have the energy input and emission levels for the oil sands. For many, the subject underlying all of these debates is the global rise of energy consumption and demand, which has opened debates on ecological modernization and an energy transition to shift society away from petroleum dependency. Paul Chastko. 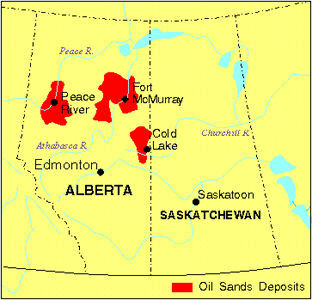 Developing Alberta's Oils Sands (2004). Conny Davidsen, Leith Deacon and Laura Kiff. Oil Literacy (2013). OilsandsSee reports and articles about the environmental, social, and economic impacts of oil sands production and transportation in Canada. From the Pembina Institute. 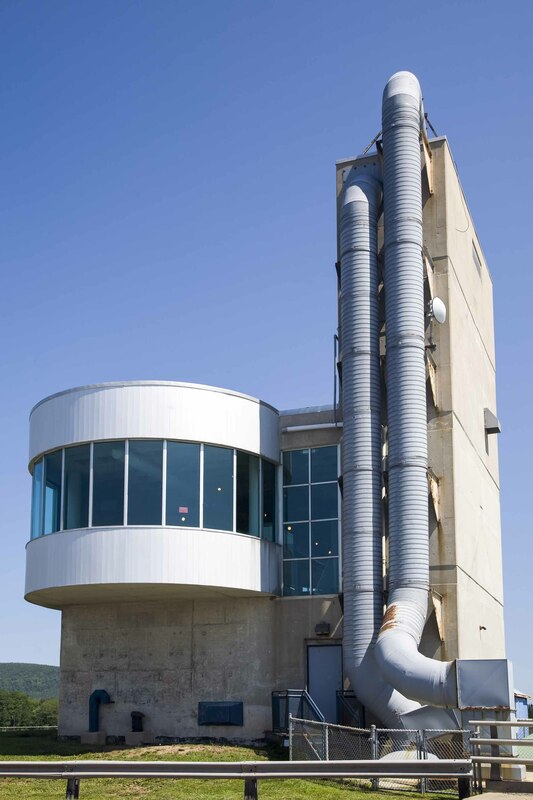 Oil Sands Discovery CentreThe website for the Oil Sands Discovery Centre in Fort McMurray, Alberta. Focuses on the history, science, and technology of the oil sands. Pipeline MapDownload a detailed map of Canadian and U.S. pipelines and refineries from the website for the Canadian Association of Petroleum Producers. Taking the ReinsA report that documents the economic, environmental, and social impacts of Alberta’s most recent bitumen boom. Also offers policy options which governments could pursue to moderate the pace of production and to maximize the public benefit that can be derived from this type of industrial activity in the province. From the Parkland Institute in Alberta. Click on the PDF link at the bottom of the page. Shifting SandsStunning aerial photographs of landscapes impacted by commercial oil sands activity taken by acclaimed Canadian photographer Edward Burtynsky. With Burtynsky’s commentary. A multimedia feature from the Globe and Mail. Alberta’s Oil SandsAn interactive website about all aspects of the oil sands industry in Alberta. From the Government of Alberta. Pipeline Transportation of Diluted Bitumen from the Canadian Oil SandsChart summarizing characteristics of diluted bitumen crude oil transported by pipeline from the Alberta oil sands in comparison with other petroleum products. From the Canadian Energy Pipeline Association.